The Pokémon GO game has gained worldwide attention over the past several weeks. This popular mobile app was installed on 5.16% of all Android devices in the US, only 2 days after its release. As a result, millions of people are amassing outdoors to try and catch digital creatures on their phones. So how can your business get in on the action? As the game is so widespread, there are many opportunities to appeal to the playing masses. Pokémon GO is a game like no other. The app actually forces people to go outside to realize the true benefits of playing. This makes it easy for many individuals to find themselves venturing into areas they’ve never been to, generating increased foot traffic in specific areas. 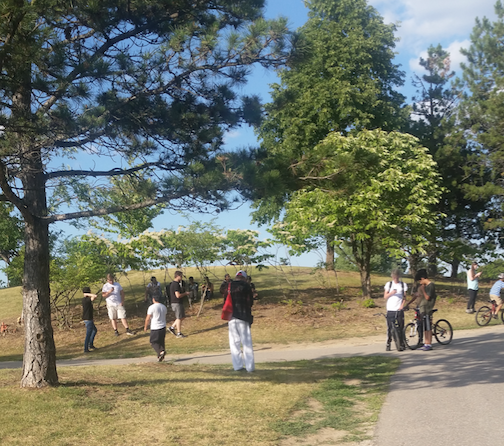 Places like Central Park in New York City are seeing thousands of players each day and many are setting up “safaris” to go out and look for Pokémon. According to Sensor Tower’s research, on average, players spend around 33 minutes playing the game each day. 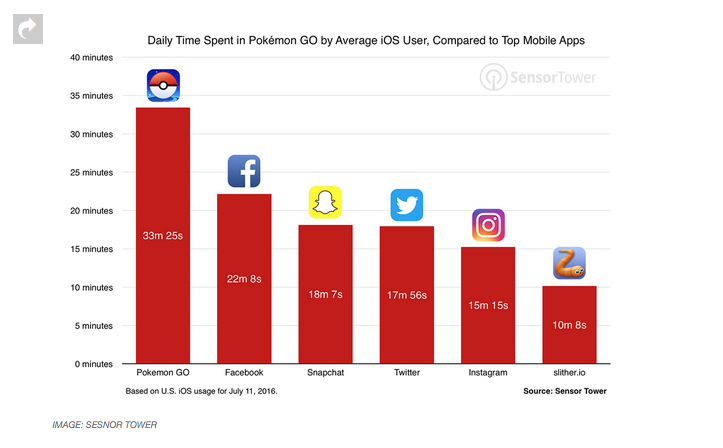 That’s more than time spent on top mobile apps like Facebook, Snapchat, Twitter, and Instagram. As an augmented reality game, there are many different hotpots where there is a higher concentration of people. There are real world landmarks that are marked as Pokéstops and Gyms within the game. Pokéstops are a source for players to replenish their supplies and win new items. Gyms allow players to train their Pokémon and battle rival teams. It is no surprise that this game has brought many people together. Players interact and socialize with each other in ways not seen in other apps. Strangers can come together and interact almost anywhere. Where there are high concentrations in specific areas, it isn’t hard to find others searching for a Pikachu. Using all of these factors to your marketing advantage will definitely help boost your consumer base. If your business is already in a populated area, that’s a bonus. Cities where there are an abundance of landmarks, creates an opportune setting for the game. Items in the game are meant to attract Pokémon to certain locations for 30 minutes. If you are able to place strategic “Lures” around your location, you will be very successful in attracting not only Pokémon, but also people to the surrounding area. This is an easy way to increase exposure for your business, and if advertised properly, will definitely boost sales. Even if there are no Pokéstops or Gyms nearby, don’t give up hope as creator, Niantic Inc., has announced there will be sponsored retail locations coming soon. Using social media to show your participation is another way to attract people to your store. In the first week of release, Pokémon had over 6 million mentions on Twitter, reports Spredfast, a social media management company. If you know of someone that has caught a rare Pokémon in your area, make sure you announce it. Anyone who comes across your tweet will definitely be more inclined to check it out. You can also take pictures of creatures found in your store and post them online. Catering to the fan base offers extra incentive to visit and creates a relatable bond with new clientele. Offering discounts or other promotions for players with specific items will gain interest. For example, giving discounts to Pokémon GO players or promoting free drinks to players with a Blastoise. Another opportunity lies in the fact the game is very reliant on data and battery usage. Take advantage of this by setting up charging stations and, if possible, offering battery pack giveaways. Anything that creates a welcome environment for the gamer will bring in new and returning customers. Pokémon GO is still in its early days but will only grow as Niantic releases new updates and features for the new phenomenon. In the meantime, get familiar with the game to see what all the fuss is about. That alone could help your business as there may be some creative ideas and related activities you can execute to take advantage of the current craze. For more information about how to leverage Pokémon Go for your business, please contact info@sproutcommunications.ca.